BOTOX� Cosmetic is a purified protein produced by the Clostridium botulinum bacterium. 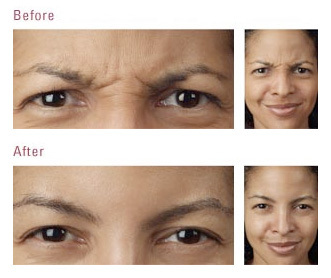 It is a nonsurgical, physician-administered treatment that can temporarily reduce moderate to severe frown lines between the brows in people 18 to 65 years of age. During treatment, very low doses of BOTOX� Cosmetic are administered via a few tiny injections directly into the muscles that cause those stubborn lines. The treatment is usually done in about 10 minutes, and no recovery time is needed. Within days, you may see an improvement that can last up to 4 months. Results may vary. Those moderate to severe frown lines between your brows form over time as the result of muscle activity. 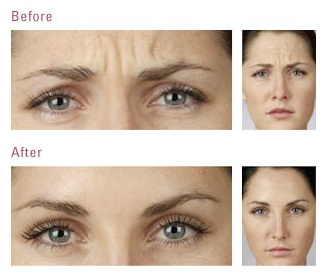 BOTOX� Cosmetic is injected directly into the muscles between your brows. It works by blocking the transmission of nerve impulses to the injected muscles; this reduces the activity of the muscles that cause those persistent lines to form. When will I see results from BOTOX� Injections?